I am talking about Kathryn, not Marley, but I have to admit they are both adorable. 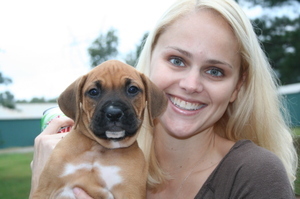 When Daws and Kathryn went puppy hunting to get a boxer for Craig's birthday, this little girl captured their heart. How could they leave her behind. So meet Marley. This is Sadie. Isn't she adorable? Oh baby! We are enjoying this sweet little girl. Last night she and Craig went to sleep in his leather chair. It was so cute. She is a very active puppy and it getting along well with her friends, Chubs, Cody and Maddie. Declan came to meet her and thinks she is quite grand. Oh baby! Craig had a boxer growing up named Queen Sue officially and just Queenie by the 8 year old boy that found her under the Christmas Tree. She was the one and only and he has never forgotten her or quite gotten over her. 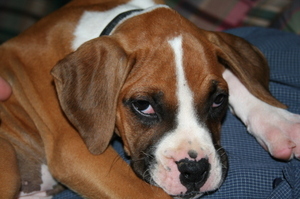 For many years my husband has contemplated getting a boxer. Since we inherited 2 labs and a dog of less than stellar breeding, the boxer has been put on the back burner for quite some time. 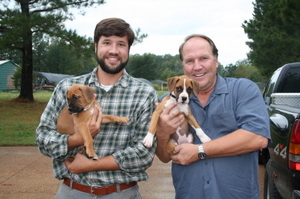 This afternoon Dawson and Kathryn showed up at our door with a boxer puppy for Craig's birthday gift. While they were picking her out, well let's just say that Daws and Kat also have a new puppy. The pups are unnamed as yet althought Craig seems to be leaning towards Saddie. She is irresistable and watching my man with a puppy...well, it just does something to me! Tears glistened in his eyes as he scooped her up. Fast friends were made and oh my, the memories! So welcome Saddie (or whatever) and your girlfriend (unknown) and may all your puppy dreams come true! The Sweet Prince came for a visit on Friday afternoon. He is so adorable that he is simply irresistable. 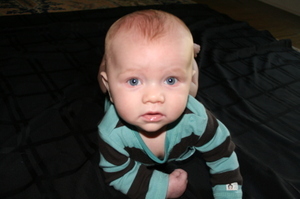 He took several little naps, visited with my Siamese kitty, Joseph, and took a bottle from his Poppa. Isn't he simply irresistable! Israel had had 60 years of wicked kings when Ahab ascended to the throne. And he did more to provoke the Lord God of Israel than all the kings of Israel who were before him (1 Kin. 16:32). How is that for a reputation? His reign was the pinnacle of wickedness. In charge of God's people. He was the leader of Israel sitting on the throne of a long succession of wicked men. If that were not bad enough, he took Jezebel as his wife. She was from a long line of Baal worshiping people. Her father was a king and a king-priest of Baal. As a part of her "dowry" she brought the hideously wicked worship of Baal into Israel when she married Ahab. She could not have been more clearly used of Satan than if he had appeared in the flesh. She was the power behind the throne of Israel and Satan was the power behind her. She quickly influenced her husband to build an altar for Baal and to worship there with her. This is in the midst of the land of Israel. Among God's chosen people. Satan used her like a pawn in his devious plan to be exalted above the one true God. And Ahab evidently never raised an objection. 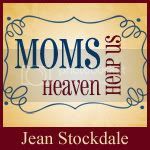 To all my bloggy mommies, I have taken time to write a glimpse of Jezebel's story as a warning to all of us who name the name of Jesus. We must become in-depth students of the Word of God in order to recognize error when it is represented as truth. We must learn God's Word and hide it in our heart so that we can detect sin when it is framed as tolerance. We must rightly divide the Word of truth so that we can teach our children in the midst of a world that has gone made. Put on the full armor of God and fight the good fight of faith! Blessings. I taught Moms at Bellevue Baptist on Thursday. I wrote most of the day on Friday (with a little break to host the Sweet Prince!). I have been writing all day today and I am suffering from Brain Drain. Seriously. My brain is fried so forgive any babbling that might issue forth. I am currently writing a new study on Elijah. It is impossible to write about this man of God without looking at the history of Israel. In short, the kingdom of Israel divided after the death of King Solomon. Jeroboam took the norther kingdom with 10 tribes. Solomon's son took the southern kingdom with 2 tribes. The northern kingdom endured 19 monarch over the course of the next 200 years beginning with Jeroboam. Jeroboam was a wicked man who set up idols and participated in the worship of false gods. He reigned for 22 years and his son, Nadab, ascended to throne. He was worse and even more wicked. 1 Kings 15:25 says, And he did evil in the sight of the Lord and walked in the way of his father and in his sin which he made Israel sin. Did you catch that? He followed in his father's footsteps. 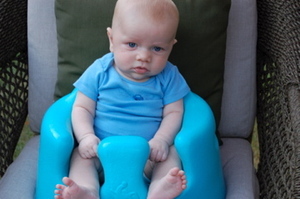 To all my bloggy mommies, is there some besetting sin that you are passing to the next generation? Serious stuff. There is more to come. This is an incredible study. I cannot escape the recurring theme of generational sins being passed from father to son and staining the third and fourth generation with its scarlet taint. Having a new branch on our family tree has caused me to rethink the mothering I did with Jason and Dawson. Somehow I was so busy trying to keep life and limb together that I did not think much beyond them. I did not think that I was "parenting my grandchildren and my great grandchildren" as I raised my sons. Serious stuff. Seriously. I will keep you posted as God's leads me on this new course of study. Stay tuned. Blessings. James 3:6 says, And the tongue is a fire, the very world of iniquity; the tongue is set among our members as that which defiles the entire body, and sets on fire the course of our life, and is set on fire by hell. Serious stuff. Words reveal the thoughts and intents of our heart in the same way our face betrays our true feelings and emotions. Word can be used to edify, exhort, instruct, encourage, exalt, enhance, build up, lift up and glorify the Lord OR they can be used to criticize, cut down, condemn and crush. The difference is a matter of the heart. A heart fixed on Jesus will produce words of affirmation and praise. Even if correction is in order, it will be received because it is framed in love and not anger. A heart (a Christian heart James was talking about) can be used to damage and destroy if the heart is full of self. Cruel words can lodge in the heart of a husband or a kiddo and never fully heal if we have an unguarded moment and give Satan the use of our tongue. The tongue, the organ God has created for His glory, can be corrupted and used to dispel cruelty and carnality if it is not faithfully kept under the power of the Spirit of God. The terrible truth of the tongue is this-Satan can gain a deadly stronghold, using this little appendage, if we are not consciously and consistently filled with the Holy Spirit of God. Moms, take James' terrible truth about the tongue to heart. Let the words of your mouth and the meditation of your heart be acceptable in the sight of the Lord. (See Psalm 19:4). Blessings. Craig and I (aka Poppa and JJ) are getting to babysit the sweet prince tonight so you know there is a smile on my face even as I type this. Seriously. Who could resist this. We are so over the moon for him and to have a chance to kiss his face right off his head is my idea of a great Saturday night. I have been busy writing all day. I started at 7:30 this morning. And since you know that I am not a morning person, you can only imagine the humor it put me in. But I have finished the first week of "Fresh Fire" which is a study on Elijah. I have 7 more weeks to go so pray for me that I will stay faithfully at the task and finish strong. But tonight I will take a break and this is the face that I will see! Blessings. I want Fresh Fire in my life. I need Fresh Fire from God to fall and consume more and more of my humanity and leave behind the glittering gold of a faith refined. I am starting to write on a new Bible study on the life of Elijah entitled "Fresh Fire." It is my intent to stoke the flame of my own passion for the things of the Lord and to kindle Fresh Fire in the hearts of our moms. I want a fresh encounter with the Lord of Glory. That is my prayer for you as well. Blessings. Seriously. Nothing soothes my soul like a trip to the mountains. Seriously. Nothing. Craig and I just returned from our yearly outing to Hippsensteal's Mountain View Bedn'Breakfast just outside of Gatlinburg. It sits squarely on top of ole Smokey and it just delightful. The rooms are wonderful and luxurious and open onto a wrap around deck that faces, well, nothing but more mountains. As far as the eye can see. Mountains. Seriously. Breakfast at Hippensteal's is decadently delicious and all homemade. It is served on china and crystal and it is well, in a word - yummy delicious. Two words, but you get the idea. If you can sneak away for a long weekend or anytime during the week, you must indulge you and your hubby and head off to Hippensteal's. We rested, we read, we walked, we talked, we sat and we stared for 3 glorious days and 2 nights and it was heavenly. Vern and Lisa Hippensteal are Christians. They are gracious and hospitable and their attention to detail is daunting. This is our 5th time to visit and we were not disappointed. They have 11 rooms I think and are often booked solid. We make our reservations in October a year in advance. But don't let that discourage you. You simply must go. Try it. You will not be disappointed. Pictures will be posted later. Blessings and may all you bedn' breakfast dreams come true! Craig and Roy were in the vehicle that he is walking in front of. Craig said at this point the bear started running and managed to get into the woods pretty quickly. 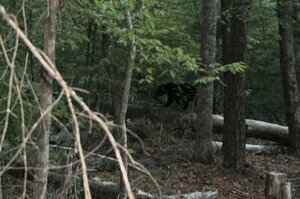 The guys were stunned to see a bear this close and I am so grateful that Mr. Stockdale got some pictures of it. He did not have my camera with him but he did have his pocket one. It was later in the day that we all got to see the one I posted previously. Can you believe it? Seriously! Craig and Roy drove up into the Smokies while I was speaking. Paul had to check on a job so he was not with them. 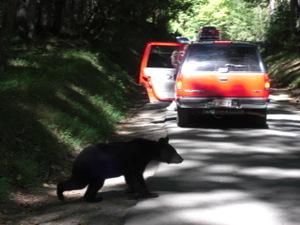 As Craig and Roy drove the Cades Cove loop road in the middle of the day, this bear lumbered out of the woods and literally walked in front of their car and scampered up into the woods on the other side. Thankfully, Craig had his small digital camera and grabbed it and got a few shots. Can you even stand it? Seriously! "As the deer pants for the water brooks, so my soul pants for Thee, O God." Seriously. Look hard at the photo. Do you see it? This weekend, after I spoke at Madison Avenue Baptist Church, the six of us drove up into the mountains. We drove the Cades Cove loop late in the afternoon. As we drove through we saw a lot of deer. 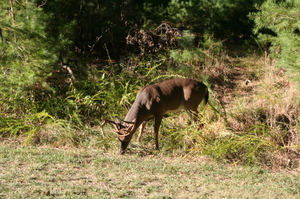 We got really close to several bucks and got some great pictures. But then we got the money shot! The car ahead of us stopped abruptly. We assumed it was more deer, but I caught the glimpse of black fur. Mule deer, common in the Smokies, have dark fur and I immediately corrected myself and said it was probably a large deer. 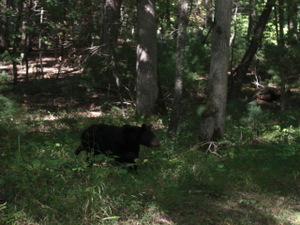 However, as we inched forward, there was a BEAR about 50 yards away. We jumped out of the car-don't bother telling me this was unwise, I know better but the call of the wild got the better of me-and I got this shot of him walking across a log. Seriously! My buddy, Paul Redmond, got a better picture but he has not emailed it to me yet. When he does, I will share it with you. In the meantime, rejoice with me at the kindness of the Lord to ordain one of His creatures to have a divine appointment with me and my camera-toting self! Blessings and thanks for looking. Dear Ones, thank you for praying for me as I traveled to Maryville,Tn. 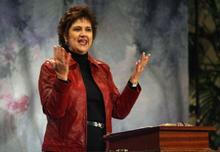 to speak to the women at Madison Avenue Baptist Church. Craig, Roy and Renae Terrell and Paul and Elesa Redmond traveled with me and served joyfully as bondslaves! The women at Maryville simply could not have been more gracious! They were excited to study God's Word and were very receptive and teachable, which as you know, made this Bible teacher's heart jump for joy. I love to teach and when I sense the group is "with me" I can hardly contain myself. Shirley Henderson headed up the committee that put the Sat. morning conference on, and she is a dear. I taught 3x and got great feedback. It was a huge blessing to be a part of this special day. It is a wonderful church with a great pastor. Pray for this part of the body of Christ. Pray God will continue to have His hand on the ministry of this great and growing church. After the event, we all headed to the mountains. We were several weeks ahead of the peak season so the leaves had not started to change yet, but the view was spectacular. We drove up to Cades Cove where we saw some glorious sights. If you will check in tomorrow I will have some pictures posted for you to see the incredible adventure God gave us up in the Smokey Mountains! Thanks to all who prayed for me. God really touched down! Blessings.